You can divide Word documents into sections. Each section can have its own margins, page size, orientation, borders, header, footer, columns, page numbering, line numbering, footnotes, and endnotes. The Breaks command, which has several options, inserts section breaks. Section breaks appear as a double-dotted line, and they store formatting instructions such as margins, page size, and page numbering formats for the section above the marker. When you delete a section marker, you also delete the instructions it holds, and the section becomes part of the section that follows it. You can use the Undo command to undo an accidental deletion. You can use the Section Breaks commands on the Page Layout tab to create section breaks. There are several types, described in the Section Breaks table. Place the insertion point where you want the section break. Choose the Page Layout tab. Click the down-arrow next to the Breaks button. A menu appears. Click the type of section break you want. Word inserts the section break. How do I delete a section break? 1) Choose the View tab. 2) Click Draft in the Views group. 3) Click the section break you want to delete. 4) Press the Delete key. 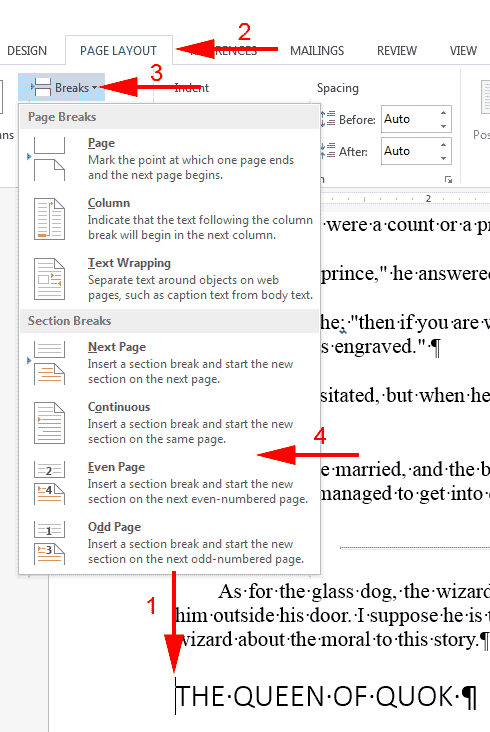 Word deletes the section break.